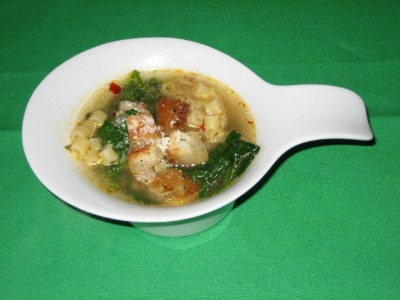 This sausage spinach soup offers a little bit of everything to keep the kids smiling. They don’t have to know that it’s packed full of protein, vitamins, minerals and essential nutrients. This pasta named Ditali means thimbles in Italian. It is a nice choice because of its fun tubular shape and firm texture and is great in soups for kids. In a large soup pot over medium high heat, add oil and sausage. Brown the sausage while breaking them up into smaller pieces for about 6-8 minutes. Now remove the sausage from the pot with a slotted spoon and set aside for later. Now return sausage back into the pot along with paprika and black pepper. Stir well and add in all the liquid. Bring ingredients to a boil and add the pasta. Reduce heat to medium and cook for about 8 minutes or until pasta is al dente. Immediately add spinach, stir well and turn off heat. If desired garnish with croutons and sprinkle with parmesan cheese. If you do not have any chicken broth handy or in the freezer just substitute it for water and add a couple of chicken bouillon cubes for flavor.